As much as possible, the layout, colour and font of the original document have been retained. WHILST the London Centre continues with its excellent programme of meetings and visits, it is pleasing to note the expansion of the Institution with its membership rising steadily. In particular, the opening of the West of England Centre, where membership now stands at eighty six members, is particularly encouraging. The opening of new centres helps to spread the good work done by the Institution and certainly raises its profile within the railway industry. Our objective is to open more centres and it is hoped to repeat our recent success by the opening, in the near future, of new centres in the West Midlands and the West Riding of Yorkshire. G.W.M.L. and the Chiltern Lines, and we are refining its specification with the help of our drivers and inspectors. New multiple units are continuing to be introduced in the forms of the Networker, Class 323 and the Class 159. Simulators will be used for conversion training for the Networker, Class 323 and the Channel Tunnel "Eurostar" high speed trains and will be evaluated for basic driver training. A new structure for basic driver training will also be trailed at a number of centres. These are but a few of the initiatives. Others are reflected in the interesting programme of events which the Institution has once again organised for the coming year. THE Annual General Meeting was held on 7 January and 24 members attended. The increase in membership was recorded with pleasure and the hope that the new intake would take an active part in the affairs of the Institution. Winter meetings are well supported with an average of 25 attending; more would be most welcome. All meetings, visits and events are open to members' railway staff friends and prospective new members. The financial statement was received and the council elected for 1992. On 4 February 30 members heard the Presidential Address by Mr Norman West on BR's quality objectives, defined as "meeting the needs and expectations of customers today and tomorrow", the customer being "anyone for whom you do anything or for whom you provide a service". He explained the strategy and the method of its implementation in his own division of NSE and related it to BR generally. There were some leading questions from the audience. A similar number of members were present on 3 March for a talk by Mr Mike Thorn (Director, Driver Restructuring) about the Driver Restructuring Initiative. He made it clear that "he did not come to persuade, but to explain" and gave a detailed explanation of the restructuring proposals to enable informed opinion to be given. New territory, with motivation, safety, careers in the future principal considerations in a situation where recruitment is vital. Mr Steve McColl is Production Manager, Thameslink, as well as NSE Steam Adviser and Consultant to BRB and private operators on steam working. He came to us on 7 April to speak about the safety of steam traction when running on BR, drawing attention to the fact that steam is good business which brings a great deal of goodwill from public and enthusiasts as well as being excellent public relations. A fine safety record exists. 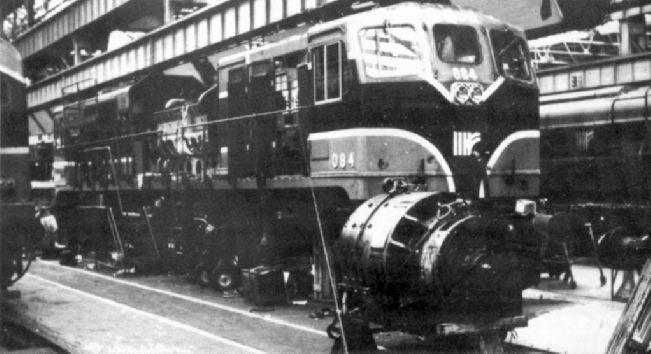 There are 2.7 steam loco mechanical failures per year — or per 40,000 miles. Our scheduled speaker being prevented from coming to see us on 6 October, Mr Steve McColl was good enough to step into the gap. A large audience was very pleased to see him again and to hear further about the steam — and other preserved traction! — policy, its problems, costs and complex organisation with regard to special trains on NSE. The art is in the combination of appeal to varied sections of the public to produce a high loading factor with interest and pleasure for all, which results in a profitable exercise. Possible future developments were touched on. interior of the tunnel and the works on both the French and English sides of the Channel. Lighting, traffic, signalling, scheduling, maintenance, safety, drainage, communications, rolling stock and locomotives were all touched upon during a most instructive and informative evening. On 8 December, L.U.L. District Line General Manager Mr Nick Agnew gave an illustrated talk in considerable detail about the operation of his line. Rolling stock is now maintained at Baling Common instead of Acton, and though some station modernisations proceed, others and some signalling developments await funds. AND 1993 PROMISES ... to be equally interesting. London Centre (see page 5 for West of England centre prospects) hopes in February to welcome Mr I. Brown, Director Rfd, to talk about Railfreight Distribution, and in March, Traincrew Training for Channel Tunnel Services will be the subject taken by Mr P. Bassett, Crew Manager, EPS. Private Railfreight Operation will be discussed by Mr T. A. Greaves, Consultant (and a past President of the Institution) in April. Visits in mind for the year include Manchester Trams, LUL Training School, White City, GEC-Alsthom and the panel box at either London Bridge or Clapham Junction. The social evening will be on Friday, 30 April in London, and the annual social day will be an outing to include a ride on the Dart Valley Railway as well as a boat trip on the River Dart, being organised by the West of England members. Expected date for this is 28 July. Members, families and friends are welcome. AN evening visit on 8 April to the Net-worker Simulator at NSE Operations Training Centre at Waterloo was interesting and enjoyable, emphasising the skills needed for driving and the thorough training necessary. The staff were most helpful in explaining the theory and practice of the forthcoming "Networker revolution" and its associated signalling and other changes. On 19 May a group of no fewer than 54 members was given a comprehensive tour of the Foster Yeoman quarry at Merehead. Somerset and its extensive rail facility, through which 75% of the 6m tonnes of aggregate produced will be despatched this year. In busier times output reaches 8m tonnes per year. 383 wagons are hired or leased and the company's Class 59 locomotives disperse their loads to 18 depots between 50 and 200km from Merehead. It was not a running day on the nearby East Somerset Railway but station, repair and running sheds and other installations there were visited later. It was pleasing to see that the party included 15 members from the embryo Exeter/Bristol centre of the Institution. A contingent from Exeter/Bristol centre was also present in the 30-odd members who were given a conducted tour of Didcot Power Station on 8 June. At present the recipient of vast quantities of coal by merry-go-round trains, soon to be supplied with imported coal (but still carried by rail) the huge generating plant and its controls were detailed by National Power staff. Each of the groups into which the party was split had an expert guide to the plant with its possible 2,OOOmW output to the National Grid. At the neighbouring Great Western Society preservation site there was no action but plenty to see. On 8 July four West of England members managed to get to Marylebone to join 20 London members for a ride on the Chiltern Line. Met by Movements Manager Garth Ratcliffe, the party split into two groups each visiting the stabling sidings and the new IECC signalling system which now controls all BR lines to Aynho Junction and Aylesbury. After lunch in BRSA, there was a big surprise when we had our own special train to Aylesbury and return driven by our member John Whittington who displayed full knowledge of route and lineside features of interest when taking the party out via Wycombe and back via Amersham. Barry Whelan (Health & Safety Officer) and Andy Bell (Engineering Assistant) showed us round Aylesbury depot, equipped to deal fully with the new stock fleet on this line. On 22 October a party of members were the guests of Westinghouse Signals at Chippenham where the areas demonstrated were PC card and automated test facilities, SSI and electronic equipment, relays, electro-mechanical items such as signals and point machines, research and development, train management systems and very large and varied systems being made for the LUL Central Line renewals. We had visited the adjacent Westinghouse Traction Works in 1991, and are most grateful to the companies for their kind reception and explanations of their many products for our industry. THIS highly successful visit started in Dublin, the programme including visits to North Wall goods yard where there is a large daily traffic in container trains, and its controlling signal box, the C.T.C. panel box, controlling main line movements and the D.A.R.T. panels. At Inchicore the works, machine, wagon and carriage shops were seen and also the running shed. Next came the D.A.R.T. maintenance depot at Fairview, after which during the journey to Bray there was an opportunity to see A.T.P. functioning in service. A trip to Belfast enabled visits to be made to Adelaide goods yard, York Road works and the central service depot. On the party's free day, members travelled to Waterford (a chance of some footplate riding on this journey), to Galway and to Wexford among the destinations. The final group visit was to Cork yard and loco shed. This week had many other visits and meetings to produce a most enjoyable and absorbing time for all concerned — our party numbered 19 with the very welcome presence of Mrs Salmon, Mrs Kirkland and Mrs Barrett. The whole party appreciated the true Irish hospitality and friendship shown during the week and, in the words of organiser and General Secretary John Lunn: "being in the company of railwaymen of the highest order". I am now employed by European Passenger Services as an International Driver. European Passenger Services (EPS) is a new British Rail subsidiary set up to operate and market passenger train services (in co-operation with other European railways) through the Channel Tunnel from London Waterloo International and mainline stations throughout the UK to various Continental Europe destinations. My first year as a driver for EPS has been one of constant learning. I have had to learn both French and Belgian train rules and regulations as well as learning the route I will be driving the international trains along. excellent at language tuition but are experts at boosting confidence too! I have found learning the railway rules and regulations for different countries a lot easier that the language training, having been a train driver for British Rail for some years. In fact, a requirement for employment as an international train driver with EPS is a minimum of five years train driving experience. After three weeks of classroom work in French rules, I went to the French depot at Tours to observe train operations for a week. Following that, I went to the Belgian depot at Mons to see their rules in operation. All the drivers, including myself, have enjoyed going to France and staying with families there to help with our language training. Most recently I spent ten days in Rouen and three weeks in Lille 'en famille' where I experienced the warmth and generosity that the French hospitality has. Study trips were also arranged and one included an interesting visit to the Paluel Nuclear Power Station where we saw electricity being produced for use by Eurotunnel. We also viewed the reactor unit and steam turbines. At the Police Academy in Roubaix some of the drivers were given instruction on compiling incident reports for the French Police authorities. We listened intently to a lecture on immigration and passport control and how the French Police will prepare to deal with any incidents involving the international trains. All the lectures and talks are conducted in French. Very soon I will be starting my 240 hours simulator training on the Class 373 Eurostar trains and the Class 92 loco that will head the international night services. We are eagerly awaiting the arrival of the new Eurostar trains and for the start of services. It certainly looks as if 1993 will be as varied and interesting as 1992 has been for me and the other new drivers. I believe that there are members or potential members who could establish centres at other locations for example the West Midlands or Yorkshire. Let's set a target of opening another centre in 1993. In the next few years we will see major changes to our railway industry with many potential private operators establishing themselves and many of our members likely to find themselves working for a different employer. Our revised rules allow for these changes, but why wait until then to spread our wings? London Transport, Manchester Metrolink and Tyne & Wear Metro all offer opportunities for new members and branches! THE YEAR 1992 has been a memorable one for the Institution. At the end of 1991 we had 154 members, and I wondered how close we might get to the magic 200 by December 1992. Well, as I write this in November, membership stands at 269* and a new centre has been established in the West of England. Attending the opening meeting of the West of England centre at Exeter on 12 October was a marvellous experience — the membership in Bristol/Exeter has gone from three at the turn of the year to 75 today. It is, of course, the hope of the council and I that more centres will open up in other parts of the country. We are the Institution for all railway staff and managers, with the simple aim of bringing all dedicated railway staff together to learn and to exchange ideas in a friendly atmosphere. Do join us. more centres will open up in other parts of the country. Our winter meetings continue to be well supported, with attendance figures now averaging between 25 and 30 per meeting; likewise, the various visits made this summer have been well supported and of quite a varied nature. Included in our programme have been visits to the Networker driver simulator at the Waterloo Training School, Didcot Power Station and Westinghouse Signals Division. IT IS particularly pleasing to note that among new members in 1992 are three from London Underground Limited. At one time, members from the Underground formed a significant and specialist part of our membership, but in recent years the connection has declined. We hope that we shall welcome more LUL members soon.